Portugal lies in the far south west corner of Europe. It’s roughly rectangular in shape – bordered by the Atlantic on its southern and western sides and Spain on the north and east. Portugal covers just over 92,000 square kilometres (nearly 36,00 square miles). This makes it slightly over two-thirds the size of England and about the same size as the US state of Indiana (or Maine if you include lakes etc). 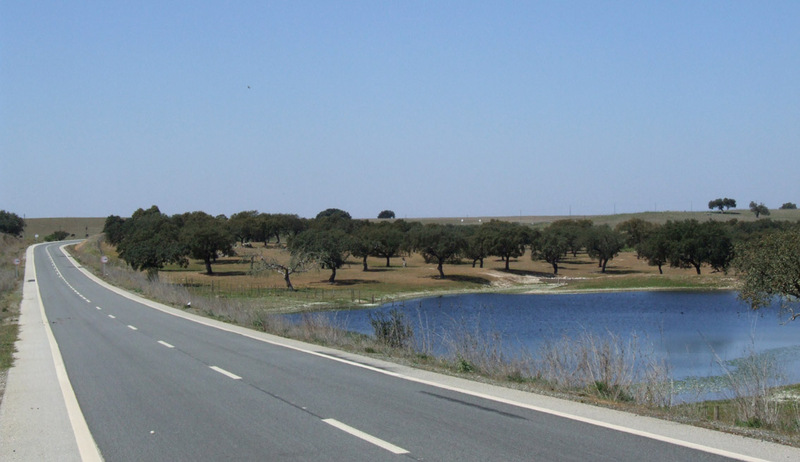 Typical empty Alentejo road – and scenery. It has a population of around 10.5 million – giving a population density of 115 people per square kilometre. This is roughly midway between the figures for Pennsylvania and Florida — but almost a quarter of England’s figure of 407 people per square kilometre. Around 2.8 million people live in the Lisbon area and 1.7 million in the Porto area. Other large cities include Braga, Aveiro, Faro and Coimbra. 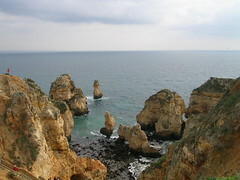 With the exception of Faro and the southern coast of the Algarve, all Portugal’s main urban centres in the northern half of the country and close to the coast. Add the population of these areas together and they account for roughly 63% of the country’s population — which will give you an idea how sparse the population is in the rest of Portugal. 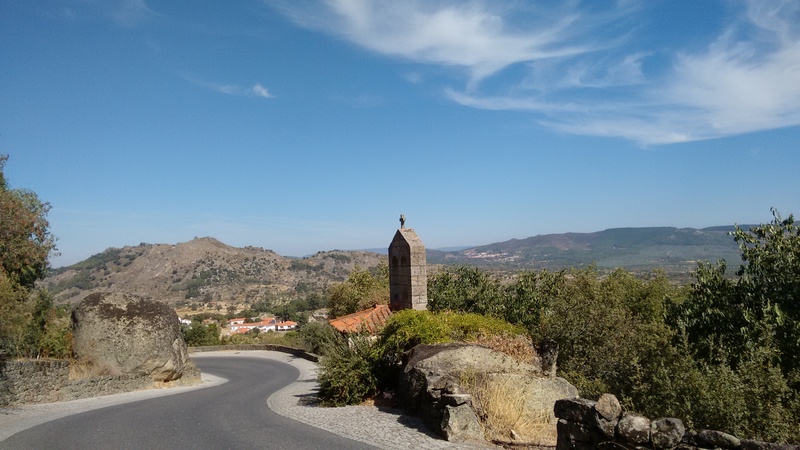 But despite the lack of people, the eastern and southern areas of Portugal are awash with history – from ancient stone circles to Moorish castles and mediaeval palaces. Many towns have centres still largely unspoilt by modern development and supposedly ‘main’ roads are as quiet as country lanes back home. All of which makes for some great cycling experiences! Portugal is not flat. Most of the country is quite rugged – particularly north of the river Tejo (or Tagus), which roughly divides the country in two. Although there are coastal plains in the north, the landscape soon rises into hills divided by deep river valleys and higher mountain plateaus. The highest point of mainland Portugal is the Serra Estrela, which rises to nearly 2,000m (6,500ft) and is regularly snow-capped throughout the winter. The southern half of Portugal is comprised of two regions. The Alentejo is mostly a rolling agricultural landscape, while the Algarve is a mixture of coastal tourist development, with more traditional towns inland. 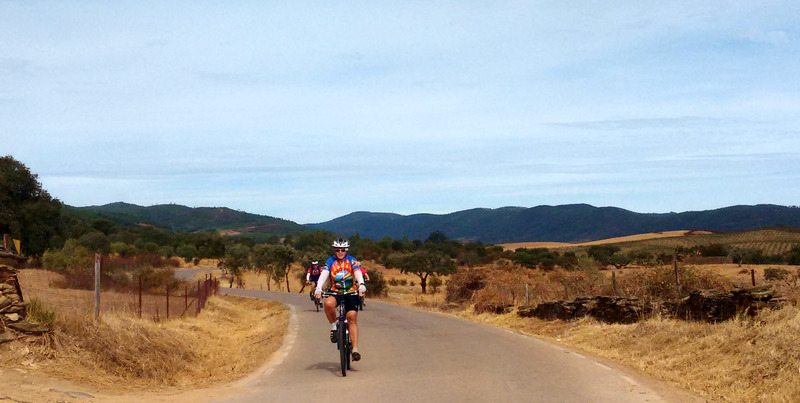 Several ranges of hills – some quite rugged – lie between the two regions, rising in places to around 900m (3,000ft). Trancoso – northern Portugal – in January. Most of Portugal has a Mediterranean climate and it’s one of the warmest European countries. For regions away from the coast – particularly in the south – afternoon temperatures in the summer (July and August) are regularly above 40ºC, even topping 45ºC (or 113ºF). However, the country’s long Atlantic coast and its high mountains can also have an effect on the climate. Sea breezes can keep summer temperatures more pleasant – although you only have to go a short way inland to loose their benefit. The mountains give some areas their own micro-climate with bitter winters and fiercely hot summers. According to a local saying, the climate of the Tras-os-Montes in Portugal’s far north east is “nine months of winter and three months of hell”. 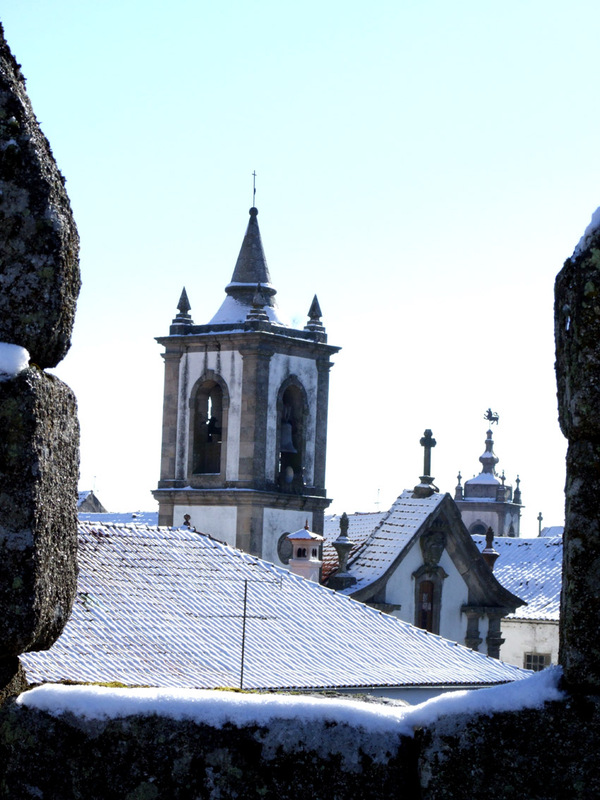 Mountainous areas of northern and eastern Portugal can be affected by snow any time between October and May – although long periods of blue skies (and freezing nights) are also common when high pressure is in control. Northern coasts are more at risk of rain and wind sweeping in off the Atlantic – but again, long periods of settled fine weather are just as common. 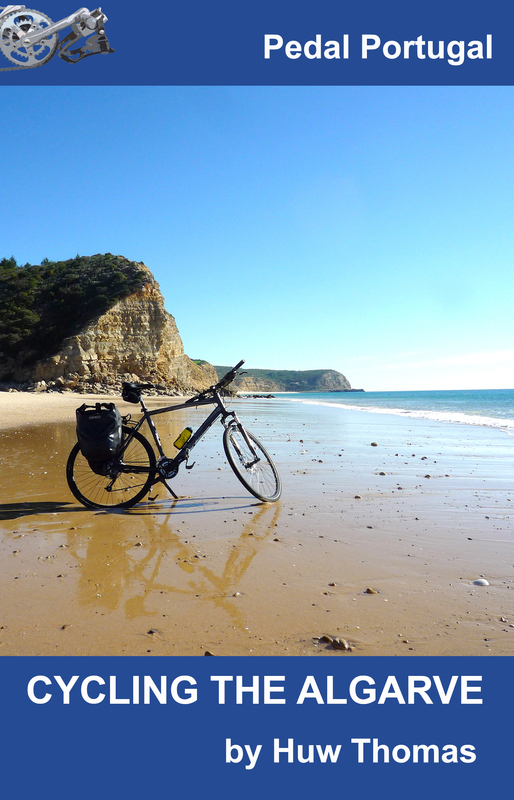 Further south, the Algarve can be a great winter cycling destination. 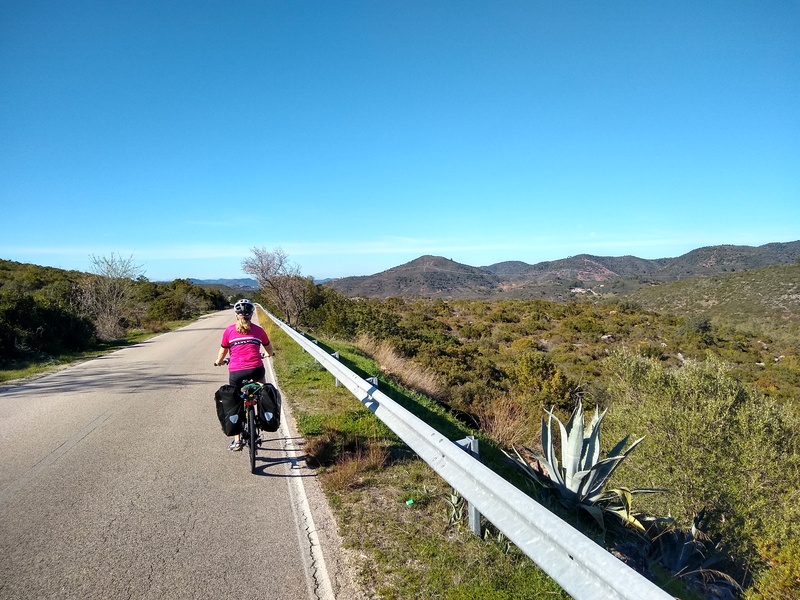 The climate is similar to southern California and — for riding — the winter is a much better bet than the summer (when the region is too hot and crowded with package tourists). See When To Go & Weather for more information. 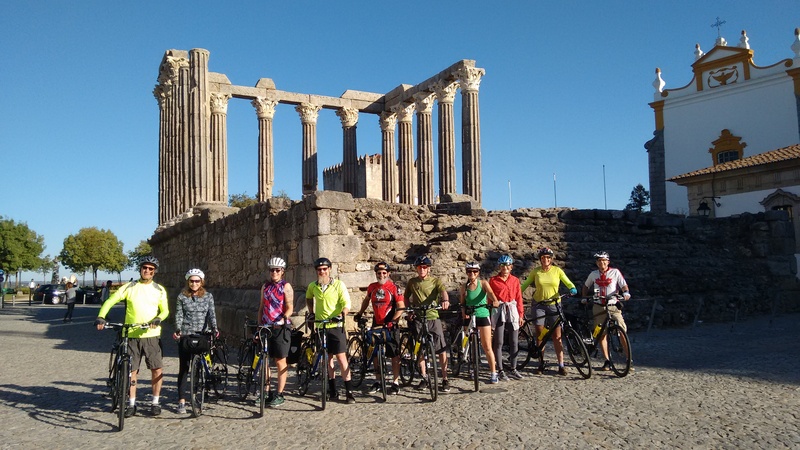 For information about cycling in different areas of Portugal, please take a look at the information on the different regions listed in the Day Rides section. 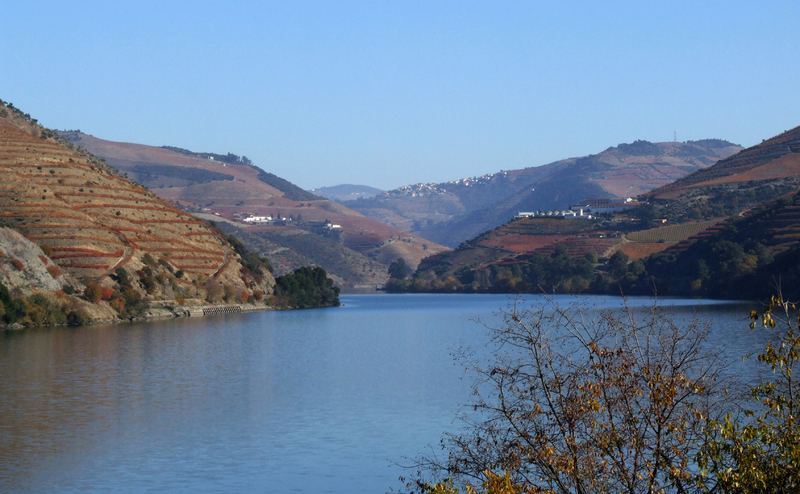 The regions are: Northern Portugal (includes Porto and the Douro Valley), the Beiras, Lisbon & Central ( includes Estremadura and Ribatejo), the Alentejo and the Algarve. Olá Huw, great site! I was only looking for one bit of info and got stuck browsing around… unfortunately can’t find that bit of info though! I’m planning on basically getting lost and seeing where that takes me next weekend, around the Tejo just NE of Lisbon, but that will most probably involve ‘mixed surfaces’. Are there any rules about which tracks I can ride? Hi Mark. Unless there’s a sign saying ‘propriedade privado’ I don’t think you’re likely to have a problem. I’ve never done any off-roading in Portugal but I’ve done a lot of walking that has included getting lost and ending up on all kinds of tracks. Just smile and say ‘bom dia’ or ‘boa tarde’. Never been challenged yet!